I’d been working at a fairly leisurely pace but, in spite of that, the bust didn’t seem to take all that long to paint. I had a similar experience with Uncle John - so it seems to me that larger scales are quicker to paint than smaller ones! I thoroughly enjoyed myself on this project. The change of subject and scale provided me with a stimulating challenge, I’ll certainly be painting more busts in the (very) near future. I’m delighted with the result I’ve achieved, but I feel that there is still so much more that I can learn; and I’m itching to have another go painting in a larger scale. Project Nurgle hasn’t been forgotten, but there’s room for another project over Christmas and the New Year break before I go back to it. Unfortunately my time for writing blog posts is very restricted at the moment. So rather than delay, I’ve decided to post the pics of Borgossa now and write a more detailed piece when I’ve more time. When I do get around to it I’ll be focussing on texture and in particular the leather hat. As I said earlier, as much as I’m enjoying ‘Project Nurgle’ I feel that it’s time to take a break and work on something different for a while. That something is Commodore Borgossa from LeBeN miniatures. 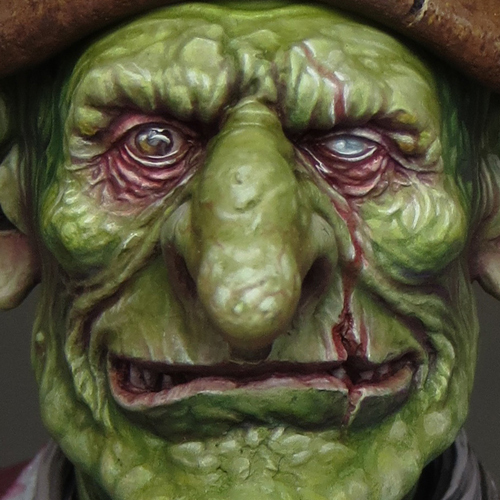 I‘d planned to start painting this bust after Euro Millitaire in 2014; but a trip to Warhammer Fest, and the release of Gutrot Spume, took my painting in another direction. There’s a wonderful selection of miniatures depicting orc and goblin pirates available from a variety of companies. In my opinion Borgossa is up there with the best of them! Less brutal than the orc sculpts and less comical than most goblins, he comes across as a distinct individual. The sculpt depicts, I think, both experience and cunning intelligence. This is not someone you would wish to risk crossing either swords or wits with. Commodore Borgossa is only my second proper attempt at painting a bust and as such posed a stimulating set of challenges. My first bust was Uncle John from Infamy Miniatures and, although I’m very happy with how he turned out, there were definitely some issues around how I chose to paint him. At the time I was experimenting with Valleyo paints and had great difficulty controlling their level of gloss. This was particularly noticeable on a larger piece like a bust. My colour palette also proved to be problematic. I painted Uncle John in a bright palate of contrasting colours giving the piece a strong visual impact. Unfortunately I think this, combined with a clean and ‘cartoony’ style of painting, resulted in the wrong sort of impact. Seeing my version of Uncle John displayed next to other painted busts, at both Euro Militaire and Salute, I was stuck by how out of place he looked. I don’t believe in painting something a certain way just because it’s in vogue and everyone else is doing it but, to put it bluntly, my Uncle John looked like a toy next to the other busts! Clearly there were lessons to be learned from the experience. The issue around controlling the finished gloss was my own fault and not one of bad or faulty paint. It’s important that a painter understands the inherent qualities of the materials he is using and employs them appropriately. This is something I’ve tried to pay especial attention to over the past year. With the addition of Scalecolour paints and inks to my toolbox, I feel I now have a good range of finishes available to me. More importantly, I’m mindful of how I use those finishes in my projects. To avoid an overly bright colour palette, I need to pay close attention to saturation and contrast. As someone whose instincts run towards a more colourful approach, I’m constantly surprised by just how far you can push the desaturation of your colours without compromising the colourfulness of your work. The quality of the cast on the Commodore Borgossa bust was near perfect, with no air bubbles and almost no sign of any mould lines. As a result the preparation time prior to painting was minimal, and that’s never going to be a bad thing in my book! The kit comes in four parts and I decided to begin painting before I assembled them. This allowed me greater access and ease of handling. For Commodore Borgossa I want to put my past experiences to good use. So I’ve decided to set myself the goal of achieving a more realistic and less 'cartoony' result than I’ve previously done in my painting. Flesh is never an even all-over colour, but there can be a temptation to paint it as if it were, and this is especially the case with monsterous flesh tones. In reality the apparent colour of skin can vary a great deal and this is dependant on many factors. For example, compare an area of skin that gets exposure to the sun to one that is covered up. In some areas blood is more visible through the skin giving a redder appearance. Look at your hand, the knuckles and fingertips may appear pink but if you make a fist, the knuckles will look lighter as the skin is drawn more tightly over the bones. You should bear all of this in mind, especially when painting something like a Plaguebearer where 90% of the paint job will be flesh tones. Bringing variation into the flesh tones will add realism and interest. It will also be a lot more fun to paint! The introduction of a couple of new colours from the palette at this stage will further push the contrasts and bring greater nuance to the overall scheme. Boreal Tree Green and Screamer pink fit into the green/red colour scheme but, as they are cooler than the greens and red already used, they extend the colour range. These ‘new’ colours should be used sparingly both as glazes and to pick out details. The mini is now ready for some highlighting and texture work. Much of the highlighting has already been created as a result of the base colour showing through the shading, but a little extra work will really make a difference. For the highlights, I mix the Rakarth Flesh base colour with a little of the Sherwood Green. I then gradually add increasing amounts of ivory to this mix as I build up successive highlights. These painted highlights are relatively discreet but they add greatly to the overall contrast and feeling of volume. At the same time as adding these highlights it is possible to introduce some painted texture. This will give the impression of the light catching on a textured surface rather than the smooth surface that is actually there. The idea is to create distinct marks during highlighting rather than the ‘usual’ smooth blends. These marks will describe the surface texture. Naturally enough different marks will give the impression of different types of texture. For example, a series of painted strokes can resemble wrinkled or sagging flesh whereas stippling will give a rough appearance. In exactly the same way that skin colour can vary so can it’s texture and some areas will be rougher or smoother than others. Texture provides the painter with another type of contrast that can be introduced to a mini, but it is important not to go over the top. Remember that the smooth areas are just as important as the rough ones for the overall effect. At this stage the bulk of the skin tones are painted, but don’t be afraid to go back over what you have done to further refine some areas. Glazes of dilute colour (I use both ink and paint) can adjust and enhance the mini’s appearance. They are particularly useful for ‘knocking back’ or introducing a little more colour to the highlights. If the highlights are too harsh, or chalky looking, glazes will tone them down and blend them in. I often slightly over-highlight on purpose and then glaze back down. This can result in a more integrated looking highlight rather than something that looks painted on top of the other colours. I don’t think it’s an exaggeration to say that mini painting is all about contrast! Contrasts in colour, shading, texture, shine and saturation are some (among many) of the factors that a painter can manipulate to gain a desired effect. One aspect that often gets overlooked is contrast in the degree of finish. Which is to say that some areas can be given far greater attention and worked on more than others. This is particularly useful when you wish to create a strong focal point. The face and stomach areas on the plague bearers are perfect for this sort of treatment. Both feature sculpted detail and are natural focal points. The face is the most obvious area to pay extra attention to. The plague bearers are a little unusual in that they have (in most cases) only one eye and no nose! This can make it difficult to work a clear expression onto the face so it’s worth spending some time on the eye to bring the face to life. Using red tones around the eye and mouth will also help with this and make them look suitably gruesome. The stomach area features a combination of sculpted detail that can be enhanced and plain areas where extra texture and detail can be painted on. I decided to paint a combination of sores, peeling skin, cracks and heavy sagging on my miniatures. These extra details can be painted anywhere on the mini and it’s good to have a concentration of them painted on and around a focal point. But try to avoid distributing them evenly over the mini like raisins in a cake. Most of this work is painted freehand but you can use a sponge to get it started off. This employs a technique very similar to that used to create paint chipping on armour. Tear off a small piece of sponge and use it to dab a rough speckled texture onto your mini. The trick here is to use a colour that is only slightly darker than the area you are dabbing it onto. Unlike the armour chipping techniqe you want to create a soft low contrast texture. Sponging generates a random texture that can then be further enhanced with highlights and glazes. Apply highlights to the lower edges of the sponged areas to create the illusion of rough pitted skin. A more elaborate texture can be generated by adding further highlights, glazes and shadows over the sponging. Project Nurgle Part 7 - adding slime to Gutrot Spume. Using baking soda to add texture to a mini. The Games Workshop (GW) plaguebearers are lovely minis to work on with lots of character and sculpted details. They are also relatively straightforward to construct and have an uncomplicated form that lends itself to customisation. For the most part I’ve kept customisation to a minimum, focusing instead on getting a dynamic twist into the poses and opening up some of the sculpted details on the stomachs to create some depth within the minis. Plastic minis have really come on over the last few years with increasingly dynamic poses and a greater dimensionality, however, they can often be a little bland in regards to their surface textures. Even the best plastic minis often have a few smooth areas that just look … plastic! Rather than being a problem this smoothness gives the painter an opportunity to create their own textures, either physically or with painted effects. To introduce some extra physical texture to my Plaguebearers, I’ve used baking soda. I mix the baking soda together with my base colour and some Vallejo matt varnish to form a thick gritty paste. The varnish is important as it makes the mix stronger and prevents it crumbling when dry. You can experiment with the proportions of the mix to vary the finished effect. Broadly speaking the more baking soda you use the rougher the finish. The mixed paste can then be applied on top of the base with a clean damp brush. Alternatively you can create a more extreme texture by building up small blobs & balls of the paste onto the mini. I’ve also pushed a few microbeads into the paste to add variety to the texture. As the baking soda mix doesn’t shrink very much during drying it can also be used to fill and cover gaps. It will, of course, dry to a rough texture so it’s uses as a filler are limited, but this is still a useful option. Once the baking soda mix is fully dry give it a coat of the base colour. I’ve listed the colours I used to paint my Plaguebearers below. I have very mixed feelings about posting exact colour recipes as there are so many variable factors that come into play with colour. Don’t get too caught up with the idea of mixing three drops of this colour with two drops of that! It’s far more important to understand the type of colour you are using and how it behaves in relation to other colours. If you want to try out the colours I’ve listed when painting a plaguebearer that’s great but I’d always recommend that you have a play with colour and feel free to experiment. I’ve used GW Rakarth Flesh as the base colour on my Plaguebearers. It’s my favorite colour to use as a base for pale flesh tones. Rakarth Flesh is a relatively neutral, desaturated, warm tone and works harmoniously in combination with other colours. The majority of the flesh will be painted with glazes by shading down from light to dark. This means that, in lighter areas, much of the base colour will show through the shading, so it’s important to ensure good even coverage. To begin shading down from the base colour, I first applied a controlled wash of dilute yellow/green (Sherwood Green ) to the mini. The effect of this first wash is quite weak; but it serves as an initial tint of colour that helps to plan where subsequent layers will be placed. The following glazes can be a little less dilute but will be applied in a more selective and controlled way. I built up successive green glazes until I defined the main light and shade areas of the mini. As the glazes build up each layer should cover a little less area than the one before. Once I’m happy with this stage of green shading it’s time to begin creating stronger contrast to both the colour and tonal range. It can also be very helpful to block in the areas of raw flesh with a deep red at this stage. Having these areas of red painted in will help with balancing out the overall range of colour & shading on the mini. It’s all too easy to be overly cautious when building up the shade on a pale surface, so the presence of the strong red will help to counter this. To begin the process of building up the contrasts, I mix red into the green in increasing amounts over successive glazes. The red and green are the foundation of the entire colour scheme. Initially I add only a tiny amount of red to warm up the green but then move through a series of deepening khaki tones through to brown and finally deep red. The interactions between these colours will vary depending on the colour mix, dilution and translucency. Red and green is a high contrast combination but the more neutral brown tones help to balance them out and create an overall harmony. I’m posting a very brief update this week as I’m busy preparing for my workshop in Cardiff this coming weekend. Despite having less time to paint I’ve managed to progress my plaguebearers to the point where they are ready for their workshop debut. You could be forgiven for thinking that maybe I’d had quite enough Nurgle in my life recently. With Gutrot Spume finally finished it must surely be time for me to turn to another subject and, so it is, but not quite yet! With my Weekend Workshop in Cardiff fast approaching I’ve been busily working away behind the scenes to get things ready. The featured mini for the workshop is a Nurgle Plaguebearer, so I’m not quite done with all those boils and sores just yet! The mini has been a delight to paint and it’s relative simplicity makes it an ideal subject for ‘Monster skin and texture’. It also makes it the fastest mini I’ve ever painted as I turned this little beauty around in under two weeks of evening sessions. I’ve also prepped several other Plaguebearers to various stages to assist with my painting demos and I’m seriously considering their potential as a unit for the Golden Demons. It looks like Project Nurgle is far from over and done!